If you're like me, you might have seen the Pokemon: Let's Go games and thought to yourself "these just seem like watered down versions of Pokemon Yellow", and you're somewhat right. The games do feel easier than the original Gen 1 games, plus with the new catching mechanic that's pretty much Pokemon GO on the Switch, you might still be on the fence about picking it up. 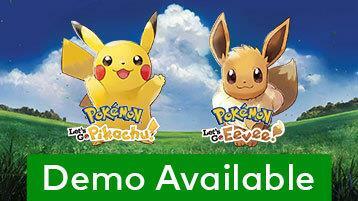 Luckily for you there's now a demo for Pokemon: Let's Go Eevee/Pikachu on the Nintendo Switch eShop. According to the official website for Pokemon: Let's Go, the demos will let you explore Viridian Forest, battling trainers and catching Pokemon with a random partner, either Eevee or Pikachu. This will give you a taste of how catching Pokemon will work in the game, and since winning trainer battles normally gives you a few extra Pokeballs, you should have quite a few chances of catching something to help you get a feel for how it works. Thankfully Zubat and Onix doesn't spawn in Viridian Forest because...well, let's just say cave areas in the full game will give your arm a work out. Read on for the official press release including info for Trials Rising, The LEGO Movie 2 Videogame, demo information for Kirby's Extra Epic Yarn, plus some current eShop sales. The LEGO Movie 2 Videogame – The alien monster invaders have left Bricksburg in ruins and taken Emmet’s friends. It is now up to Emmet and a host of heroic characters to go beyond their world and save their friends from the strange inhabitants of the Systar System. Journey into outer space, discover new worlds and test your Master Building skills. TheLEGO Movie 2 Videogame is available Feb. 26. Remember that Nintendo Switch, Wii U, Wii, New Nintendo 3DS, New Nintendo 3DS XL, Nintendo 3DS, New Nintendo 2DS XL and Nintendo 2DS feature parental controls that let adults manage some of the content their children can access. Nintendo 3DS players who register a Nintendo Network ID gain access to free-to-start games and free game demos from Nintendo eShop, and also get the latest news and information direct from Nintendo. For more information about this and other features, visit http://www.nintendo.com/switch,http://www.nintendo.com/wiiu or http://www.nintendo.com/3ds.